We have a LOT of toys between the three kids who range in age from 8.5 to 1. I love the fact they have a vast variety of interests, from Barbies to bikes, trains to play doh, arts and crafts, puzzles and games, but that does mean there is a huge assortment of stuff to store. 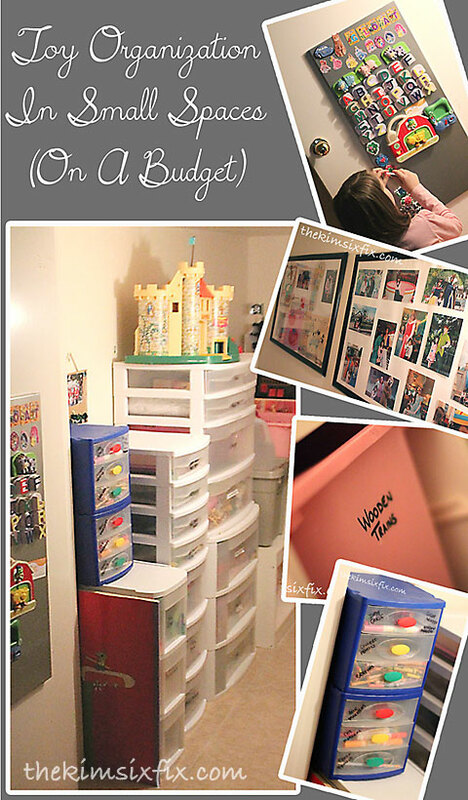 I already talked about this subject a little in my Girls’ Bedroom Makeover post, and today I thought I'd share with you how we deal with toy organization in our house. We have designated it “the toy closet” and we keep most of the kids’ toys there. It allows easy access to the toys without having them out in the open all the time. In order to fit everything in this tiny space, I had to come up with a system to organize and store the toys that keeps them out of the way, yet easy to find and use. Plus it has to be KID FRIENDLY. There is no point to having a toy storage system if your kids can’t figure out how to put everything back. What exactly is in the closet and how is everything stored? We also have a similar 4 drawer storage cart ($19.99) for additional storage of board games and puzzles. The small flat drawers are perfect for wooden puzzles and large coloring books. We didn’t add the casters that came with them, in order to keep them stationary. The nice part is the drawers can pull completely out, so you can carry the toys to where they want to play with them, and when they are ready to clean up, throw everything back in the bin and slide it back in place. They also stack perfectly since they are all Sterilite brand. My theory about organizing is that IT DOESN’T HAVE TO BE PERFECT. If you are paralyzed and overwhelmed by the “Pinterest-ing” of organizing, you need to give yourself permission to do something the fastest and easiest way, even if it isn’t the prettiest. Maybe one day I will go back and label them in a cuter way, but if I had waited until I had the time to do it right now, the toys would still be in chaos. Sometimes you just need to get the job done! For things that are too bulky for the drawers (musical instruments, R/C cars, oversized board books, dinosaurs and puzzles) We use this large step shaped Trofast system with deep bins (I love this one so much I am planning on getting one for the girls' bedroom as well). The notches above the “steps” are a perfect place to store things like doll houses, large toys and large bins. On the opposite wall I hung some of the girls’ favorite snapshots from Disney, along with their artwork. Since the space is so narrow and they tend to rub against the wall, I knew I couldn’t do a true gallery wall, or use any frames that hang away from the wall. Once again, IKEA comes to the rescue. Their $4.99 Saxnas Poster Frames are the perfect solution. I can add lots of photos and easily change them out. The frame itself is less than 1/4 inch thick and made of plastic, so I’m not worried about them knocking them off the wall. The back wall features some DIY wooden frames the girls made at one of the Home Depot Kids workshops. I didn’t want to throw them away, but the foam stickers didn’t fit into my living room decor. (*wink*) The toy closet is the perfect place to display them just for the kids. To wrangle all their magnets, I installed the Spontan Magnet board ($12.99) on the door. It is so nice to let them have a place within reach to play with their magnets, without having them camped in front of the fridge, scratching up the stainless steel. All the organization supplies were less than $200 total (and were purchased over time in order to not have to spend the money all at once) It has been great to be able to tell the kids to “put this toy back where it belongs” and actually have a place for everything. And it is a dynamic system. When something get purged and replaced, I can quickly wipe off the drawer and easily label it with the new contents. And since the drawers are mostly see-through, even the 5 year old who can’t read yet, knows exactly where everything goes. Do have any other tips or tricks for organizing in small spaces? How do you handle all the toys? That's an awesome set-up you have! Our living room has been taken over by toys. and a couple of smart furniture choices have helped, but there are still too many toys! I really need to organize my son's room. Toy mania in there! Thanks for the motivation and great tips! Ah. I love it. I am sucker for good organization ideas and tips. Organizing is like a hobby i love doing. Thank you for all the cute ideas. It looks like a wonderful idea. I totally know how you feel. It is so nice to be able to put everything away, once and for all! It is amazing what actually fits in the closets once you actually sort it! When the stuff is spread out it amazes me that it all came from this one tiny closet! Love these ideas! I need to organize my kiddos toys better. Thanks for the tips. I'm so glad to be over the toy mania stage though I still have some of the toys my kids loved the most and I think I'll keep them until I can give them back for them to have in their own homes.